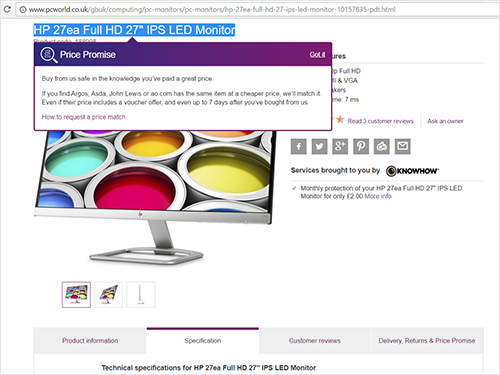 A clever little tactic on PC World's website impressed me today whilst shopping for a new monitor. I selected the title of the product and copied it - ready to paste it into Google - and the site popped up a message telling me about it's price matching promise with selected competitors. Personally, I was just going to Google the title to find out if it could be wall mounted, but very often people copy and paste an exact product title so as to see if they can find the product cheaper elsewhere. I thought PC World taking this as an opportunity to remind customers about their price comparison services is a considered, clever way of trying to keep hold of your purchase.